I've been re-thinking my plan for the nursery a little bit to save some money. I'm hoping to DIY a few more things and re-use things that we already own. 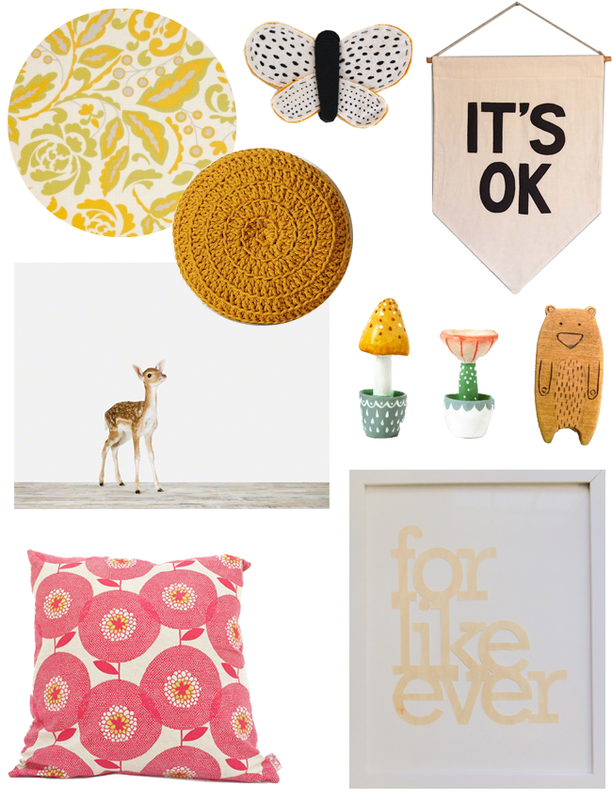 We already have the Sharon Montrose print and pretty hand-printed pillow from Skinny Laminx, I made the 'for like ever' birch veneer artwork, and am hoping to DIY a banner similar to the one above, the soft-sculpture butterfly, and perhaps make a crib sheet out of the Taza Cynthia fabric in yellow. I may also make a couple of cute little toadstools similar to these. The only things I don't think I can make myself are the wooden bear (which I already purchased - he's just as adorable in person) and crochet pillow (although I'd love to learn to crochet! ), but I may search Etsy for a while until I find a similar pillow with cheaper shipping. I think it makes total sense to save your money, especially since the space already looks so great. I like the new plan and I am sure your baby would rather have you than a just-so nursery. Also, it's not crochet, but Urban Outfitters has a round pillow in mustard that I think is really pretty.